Cape Town’s new Green Point Stadium held its first competitive match last week, as Ajax and Santos took part in an exhibition match that gave 20,000 Capetonians the chance to check our their magnificent World Cup stadium. It can be safely said that the stadium was the star of the show more than the footballers playing on the pitch. Everyone there was enthusiastic to be a part of the inaugural game. After months of watching the stadium being built, locals finally had the chance to see what was inside. Judging by the great atmosphere and loud roars, Green Point was given the seal of approval by everyone present. The afternoon had a wonderful festival atmosphere, as the crowds were entertained by performing artists before, during and after the match. If this a small taste of what the World Cup will bring, we’re in for a fantastic experience! 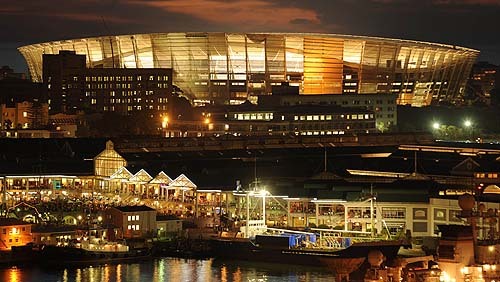 The first World Cup game at Cape Town Stadium is Uruguay vs. France on June 11, 2010. Book your English course in Cape Town be a part of this footballing feast.